At ILNumerics we get a lot of support requests every day. During the last couple of months some questions were related to installing ILNumerics. In some cases an unexpected error message appears. The easy solution is to manually uninstall our extension from all Visual Studio instances and then reinstall ILNumerics. This issue will be resolved once we release our new installer. Since the error is mostly related to the software upgrades, I was able to realize it on my computer. I have been playing with the installer and the build for quite some time now. I had an intermediate build being installed on my computer. I downloaded the official trial to use it for demonstration purpose. The following thing happened to me. Visual Studio potentially gets confused when trying to install / uninstall multiple installer versions. Especially when such installers have the same major and minor version number. If one receives a software upgrade, it usually means the major and minor version is not changed. Therefore it is not a considered as major or minor upgrade. The easiest way to detect it, is after uninstalling ILNumerics. Check the VS Extensions (Tools -> Extensions and Updates). 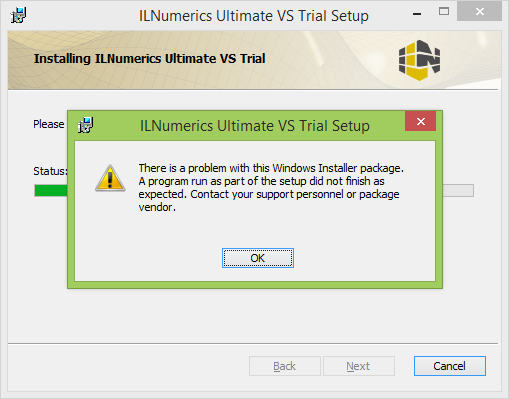 If you still see ‘ILNumerics Ultimate VS…’ installed that means you manually have to remove it. Unfortunately we have made some mistakes, and somehow it is not being removed correctly. This is something which happens occasionally. A suggestion is to remove the VS extension manually. It is not a normal, nor an intended way of handling (un)installing ILNumerics. It is a workaround. I did the following: from VS 2010 to 2013, I manually uninstalled the VS Extensions (note: VS 2010 needs to be started with admin rights to be able to remove the extension). For me, after the removal of the extensions, the installer went smoothly Hope this helps in some unexpected cases! We would like to make the installation process smoother, feedback and ideas are welcome.